I’m Peter Lynch and I’ve been an author, travel writer and hotel reviewer for the past 12 years. I’ve written internet travel guides to Albania, England, Luxembourg, Macedonia, and the cities of Darwin, Dubrovnik, Oxford and Reykjavik. I’ve written print features about cities and countries around the globe for the Reading Eagle (Pennsylvania) the West Australian and a host of UK magazines. I have particular expertise in Wildlife Conservation Volunteering, have a degree in biology and have been on several volunteer projects and produced the definitive guidebook in 2009, updated in 2012. I am also a great fan of rail travel having travelled extensively throughout Europe and contributed to Great Train Journeys of the World (Time Out, 2009). But my greatest rail journey has to be an Around The World trip from London to Sydney and I have at last finished the book (Overland from London to Sydney) about the journey. Flying to Australia is boring, especially if you think of all the fascinating countries that are being bypassed - out of sight below the clouds. Like millions of others I’ve flown to Australia, and been bored stiff, but this time I’m going overland by train. I was able to connect up with a whole series of trains, which took me virtually all the way from London to Sydney. It’s not an artificial TV adventure trip with a dozen behind-the-scenes fixers, nor am I doing mad antics, crackpot pastimes or piggy backing on some fund raising scam. This is an everyman story that anyone could do and is the most brilliant way to travel. I could potentially have made the trip in 3 weeks but instead spent 3 months stopping off wherever I felt like it. Starting from London my route crossed Europe into Russia, east across Siberia, south through Mongolia and into China. From Beijing I trained it to Hanoi and then took the Reunification Express to Saigon, with a few stops on the way. I followed the Mekong north through Cambodia, onwards to Bangkok in Thailand and down the Malay Peninsula to Singapore. My only flight was the relatively short hop from Singapore to Darwin and then it was trains all the way to Sydney and Perth. 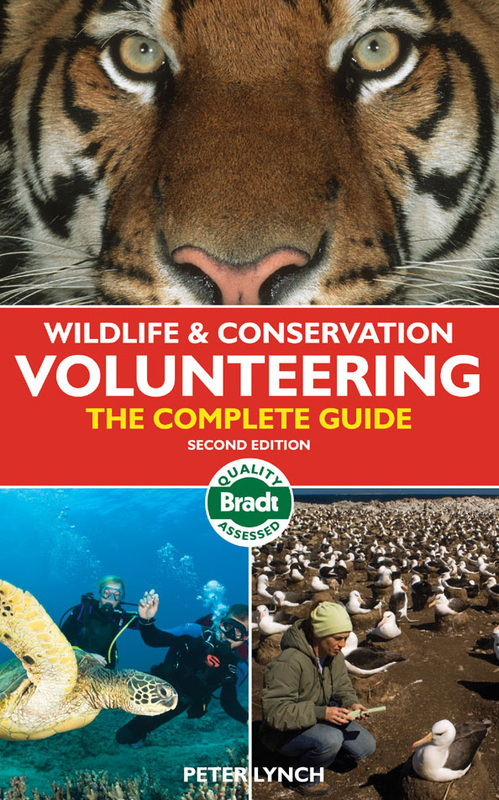 The second edition of Wildlife & Conservation Volunteering - the complete guide was published in March 2012. It’s been completely revised and expanded, including updated evaluations, new organizations, more volunteer stories, more field adventures and new photographs. There is also a new chapter on great wildlife migration events – how, when and where to see them, with more great photographs. It’s a must read for anyone thinking of working with wildlife, planning to volunteer on a gap year or anyone who simply wants to holiday with a purpose. Conservation volunteering is so much more than a wildlife trip or safari, not just for the positive feel-good factor of doing something useful but because of the hands-on involvement and insights they provide into the life of wild creatures & the countries they inhabit. After the book my other big project in 2011 was an overland trip by rail from London to Australia (see Rail Travel page). No Z list celebrities were involved; I didn’t ride a unicycle, hop along the Great Wall of China or engage in any other mindless attention seeking activities. I simply took a train across Europe to St Petersburg, across Russia, down through Mongolia into China then south into Vietnam and the reunification express down to Saigon. This is the only gap in the world’s rail network so I had to take buses north through Cambodia and across in Bangkok where I was able to pick up the rail network again and travel down through Thailand & Malaysia to Singapore. A flight across the Timor Sea enabled me to pick up Australia’s rail network & travel down to Adelaide, across to Sydney & finally back to Perth. Time Out Great Train Journeys is a selection of forty of the world’s best train journeys, from nostalgic steam trains to state of the art high-speed locomotives. Beautifully illustrated and written with passion, it will appeal to dyed-in-the-wool railway enthusiasts, but also reaches out to a new generation of train travellers, both actual and armchair. Divided into inspiring sections such as Crossing Continents, State of the Art, Cultural Experiences, Nostalgia and Scenic Spectaculars, this book will appeal to people for whom rail journeys reflect the contemporary mood of travel which cherishes the individual, the ethical and the characterful - time well spent above time quickly spent. Trains no longer belong only to trainspotters, and Time Out Great Train Journeys is the first train book to have a contemporary, quirkily fashionable feel to it. Written by professional travel writers, who love travelling by train, its not a commercial sales pitch or simply a great coffee table book – it’s a dam good read.